When field engineers encounter an equipment problem they can't solve, they have to contact and collaborate with many stakeholders. In the past, this was done ad-hoc, and kept staff from recognizing repeat problems. Also, vendor or other external parties often need to gain access to reports and resources through an onboarding process, which can take weeks of precious time. To improve this process, field technicians need a way to collaborate with and quickly onboard third parties. 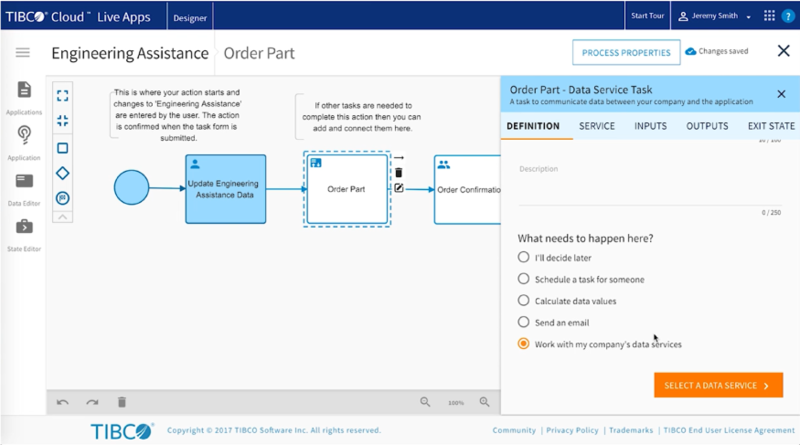 Using TIBCO Cloud™ Live Apps five-step interview, they can easily translate their requirements into a fully-functional app. Speedy application delivery is at the heart of Live Apps, TIBCO’s low-code development platform. And with Live Apps, they can start simple, and if requirements change, extend the app to evolve the way the team works—a perfect environment for digital transformation. Watch as Live apps is used to create a field technician mobile application to answer the business needs in this Oil and Gas use case. With Live Apps, all field staff are equipped to report, empowered to diagnose safety issues, and able to create work orders on the spot. This allows for quick decisions and swift actions. This means, field technicians are empowered to quickly resolve and complete work orders while on the go. Fast and intuitive data collection allows for quick reaction to any pending issue. Predictive analytics provide insights to solve problems even before they occur. As soon as any issue is identified all parties, including maintenance and potentially external suppliers, are alerted. This empowers employees with tools and insights to transform and improve operational excellence. Learn more on TIBCO in Oil and Gas Integration.